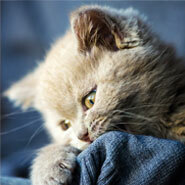 At Elaine’s Pet Resorts we know cats are very independent by nature, but we know they need just as much love as dogs. Our cat boarding accommodations are clean and comfortable, and all our feline guests enjoy regular and loving attention from our caring, experienced and certified staff. In order to provide them a safe and relaxing experience, our cat boarding guests receive their own special Kitty Condos in a dog-free section of the resort. 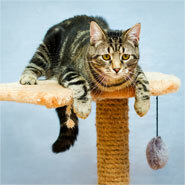 At Elaine’s Pet Resorts, cats will have ample opportunity to exercise or lounge around in our cattery play area. Large cat trees and toys fill the cattery which features large windows for guests to enjoy a great view of the property. We value exercise and playtime for all our cat boarding guests. 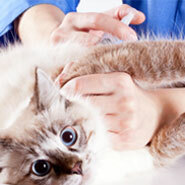 For the health and safety of our pet guests, Elaine’s Pet Resorts requires up-to-date vaccinations for Feline Rabies and Feline Distemper. Proof of vaccinations is required for all visits and certificates can be faxed or provided at check-in. A staff specialist will review these with you when making your reservation. We understand that a well- balanced diet is important. 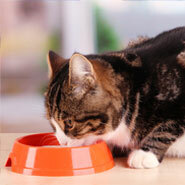 That’s why we feed our feline guests Purina® Naturals and Purina® Beyond. Parents can bring food from home in individual serving size bags. For dietary restrictions, sensitivities or allergies, notify us while making your reservation or at check-in. We do our best to make your kitty as comfortable as we can. Feel welcome to bring non-perishable treats and one or two favorite toys which we will label upon arrival. Due to water usage restrictions, we are no longer able to accept personal bedding or blankets in order to reduce laundry and conserve water. We're Open Seven Days a Week!